... and a peaceful and rewarding New Year full of LOTS of gardening! Yikes! I am four days late posting my bloomers for December. I actually ran out and took these pictures during a rain break on the 16th, but it's taken me two more days to put the post together. So what did I find out there? 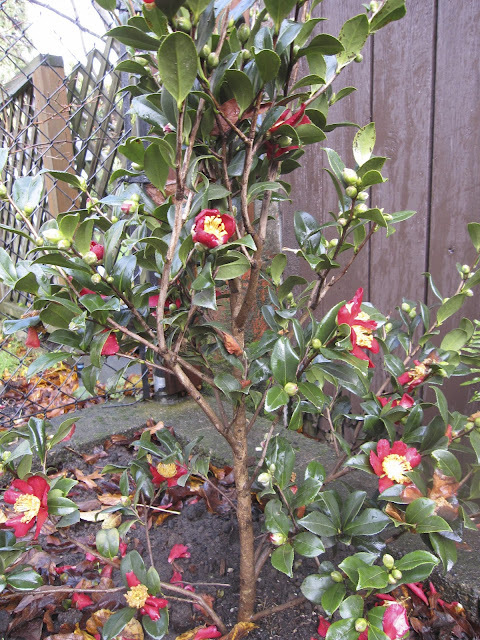 I'm still grooving on the recently planted Camellia sasanqua 'Yuletide' I showed last month. All three are blooming now, and their amazing flowers have held on through torrential rains and some pretty substantial winds as well. 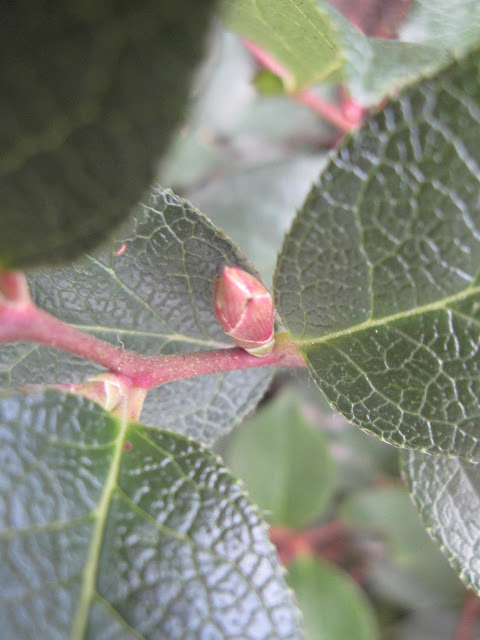 A few Evergreen Huckleberries (Vaccinium ovatum) are already opening. Our lack of cold weather is encouraging growth of all kinds, but I wonder what the downside may be later. Abutilon 'Tangerine', still pumping out a surprising number of blooms. There are a few blossoms on Salvia 'Black and Blue'. 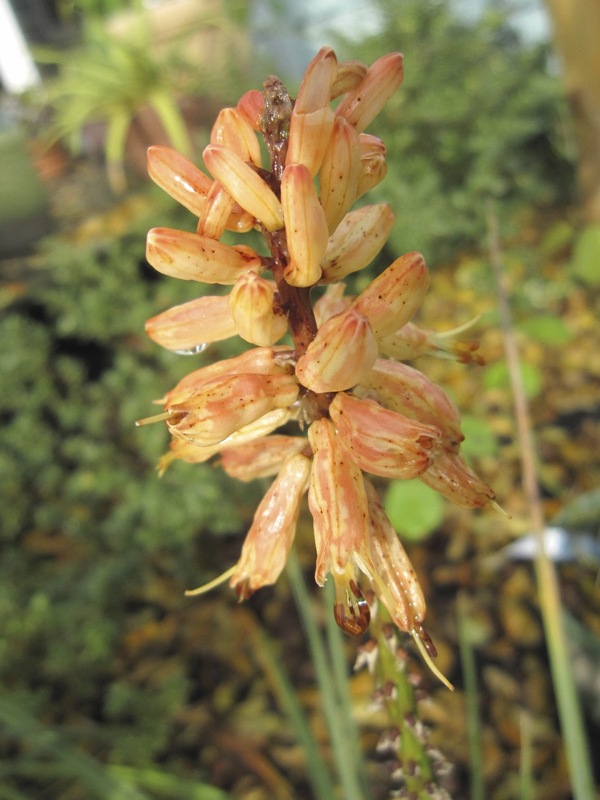 This is the exact same Kniphofia 'Timothy' bloom I showed a month ago for November's Bloom Day. Clearly, it has weathered, but it's still hanging on. Fatsia japonica is such a kick at this time of year. A couple of random Ceanothus thyrsiflorus 'Victoria' flowers surprised me. And it wouldn't seem like December in my garden without a few Rosemary blossoms. Rosemarinus prostratus 'Bonnie Jean' is reputed to be hardier than most prostrate varieties, though last winter and what we've seen of this winter have not been much of a test. 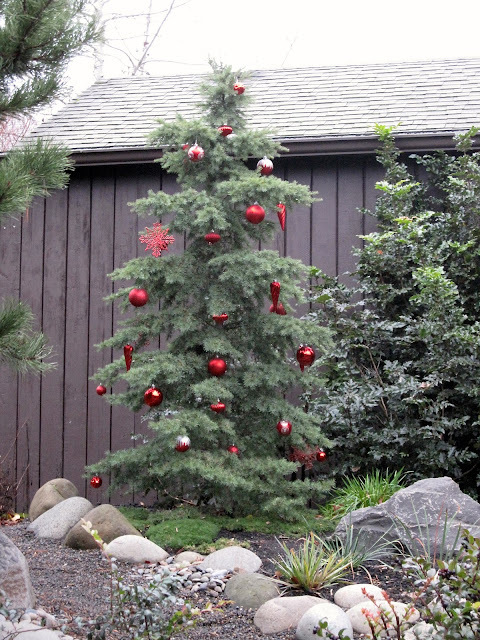 Visit our host Carol, at May Dreams Gardens, for a look at mid-December blooms in gardens all over. Happy Belated Bloom Day! Yes, I know it's just early December. We haven't even passed the winter solstice yet. Leaves are still hanging on the trees around us. But thank goodness many plants are preparing themselves attractively for Spring's blooms and foliage, so here's what I'm seeing as I look hungrily for signs of that renewal. It just can't come fast enough for me! Camellia sasanqua 'Yuletide'. Many of these buds have already opened as you can see in the background. Embothrium coccineum with its fuzzy red buds. It's years from flowers, but I'll settle for new growth this spring. How about you? Can you "be here now", or are you already jonesing for Spring?